It’s been an incredible week at Leap Motion and around the world. We’ve leaped into Google Earth, watched the NASA Space Apps Challenge unfold, and released brand new Unity examples with the latest SDK. Airspace submissions remain open, while applications to the developer program are closed. We have some more UI elements and sample code in our community toolkit, plus stunning new trailers showcasing the latest apps from your fellow developers. 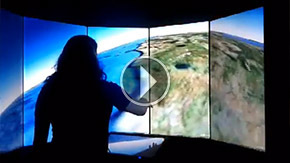 Earlier today, we announced that Google Earth’s desktop client now supports the Leap Motion Controller. We called on you to explore the world with your hands and fingers, and post videos with the hashtag #LeapInto. We loved watching your videos and hearing about your experiences. Below are just a few of our favorite #LeapInto videos: New York, Copenhagen, San Francisco, and Istanbul. @bantherewind: @LeapMotion’s native support in @googleearth is fantastic. Takes a minute to train, but great experience when you do. Over the weekend, more than 9,000 people in 83 cities around the world collaborated in a grand global hackathon: the International Space Apps Challenge. We’re thrilled to announce that developers using the Leap Motion Controller participated at eight sites, and won several awards for their efforts. Our San Francisco, Reno, and NYC teams – who collaborated with teams in Syracuse and Rochester – won first place for creating a command-and-control interface for OpenROV. As well, our team in Philadelphia won second place for their EarthKAM Explorer. Congratulations to everyone who participated – thanks for making our world a little bit better. 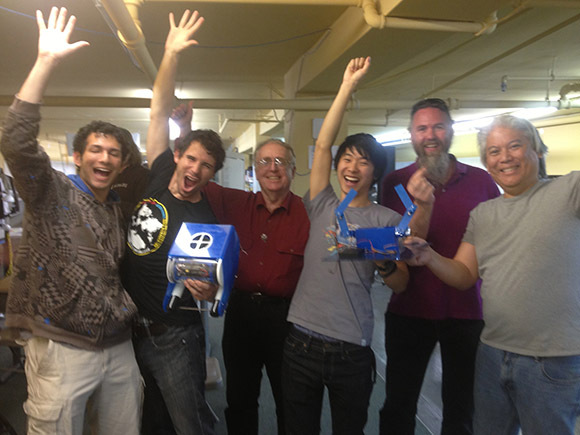 TeamROV in San Francisco celebrates after being announced winners for their collaboration: designing and testing an interface that allows control of a telerobotic submarine from a distance of more than 50 miles. We released a pair of Unity examples along with the latest version of the SDK. Leap DJ shows off the concept of a physically inspired UI which is used to create an intuitive set of tools within a digital environment. Leap Flying shows off a concept for two-handed flight controls, which make it easy to control a maneuverable airship in a densely packed cityscape. No detection by the computer immediately after upgrading, although the device starts working after unplugging it a couple of times. Intermittently giving no tracking data, even though the FPS is not 0. Occasionally triggering driver errors on OS (e.g. Windows: “USB Device Not Recognized”) right after powering up the device. If you were affected by this problem, you should install the latest Leap Firmware Updater Tool. As well, we’ll be issuing a firmware upgrade to all users with the next SDK release. If you continue to experience problems, please get in touch directly with Jimmy He. If you didn’t get your app submitted by April 19, don’t worry – we’re still accepting apps in the lead-up to launch. However, if you want to be among the first on Airspace, we encourage you to submit your app as soon as possible. This will ensure that we have time to review and test the software. Are you getting ready to submit a web app or website? The submission process is currently tailored for downloadable apps and experiences, but we’re also planning on promoting web apps and websites through Airspace. If you’re interested in submitting a web app or website for consideration, please email submissions@leapmotion.com and include a link to your Leap Motion-enabled experience. In other news, we recently closed the applications process for the pre-launch early access program. In a couple of weeks, all applicants will receive access to the SDK and Developer Portal ahead of our public launch. To learn more, check out our thread on the public forum. With the right visual and auditory feedback, you can provide your users with simple, intuitive cues that show how your application responds to their actions. While there are endless possibilities for how inputs can be visually represented, those that appear on screen should be simple, functional, and non-intrusive to the core interaction experience. a. Invisible forces. The forces of attraction and repulsion can be used to your advantage to create seamless, invisible interactions. b. Shadows and lighting. The use of these visual cues can reinforce the illusion of depth, helping your users orient themselves in a 3D space. c. Music. Visualizers and changes in pitch and tempo are essential to music apps, but also play a dynamic feedback role in other types of software. d. Events. Whether it’s an explosion, dropping something, or a tower falling down, dramatic events are effective feedback strategies in many apps. We’ve included some of our favorite examples of input representation and dynamic feedback below. You can click on the images to see a high-res version with more extensive explanations of each screenshot. Above: (1) Roshambo takes the direct approach by depicting actual hands playing the classic game. (2) In Spellcaster, you can cast spells with a tool (like a pencil), represented by a wand. The trails from the wand provide dynamic feedback, allowing young wizards to judge whether they’re making the right gestures. (3) Leap Motion’s Flocking demo uses points of light to represent the user’s fingertips, while the movements of the fish help them to understand the effect of their movements. Above: (1) theLIFT’s Block 54 uses paddles, glow effects, and beams of light to help users understand how their hands are interacting with blocks. 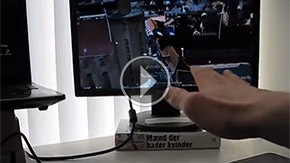 (2) Snibbe Studio’s Oscilloscoop features a responsive cursor that shows users how far they are from the interaction space by showing a cylinder approach a target based on your finger position. (3) Fingertapps Piano uses colored keys to indicate which notes to play, hammers with shadows to indicate finger placement, and exploding stars for each correctly played key. We’re curious to hear your thoughts. What techniques have you used to ground your users in your app’s mechanics – while also introducing them to the possibilities of motion-control interaction? Join the conversation, share your thoughts, and post your sample code today. It was another great week for sharing on the forums. Below are the latest UI elements and sample code released by your fellow developers. Remember, you can always access these examples through the example tag on the Links & Libraries page. Last week, theLIFT released another interactive element to the community: a shape rotation sample. This allows you to use one to five fingers to rotate a shape in the center of the screen. Luminary Productions has released their fourth Unity experiment, which includes three basic selections: hover, tap, and pinch. BradLarson posted the source code for his molecular viewer for Mac, which has been optimized for the Leap Motion Controller. We believe that artistry and the Leap Motion Controller go hand-in-hand. Created by Anastasiy and the Crispy Driven Pixels team, Ethereal is an app that allows you to draw in the air with Photoshop. 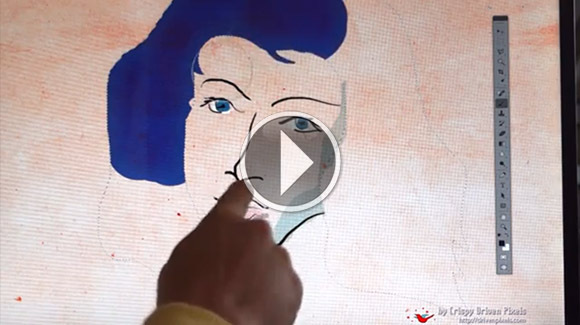 Draw with one finger, change the brush size with two fingers, tweak colors, and create beautiful digital art. 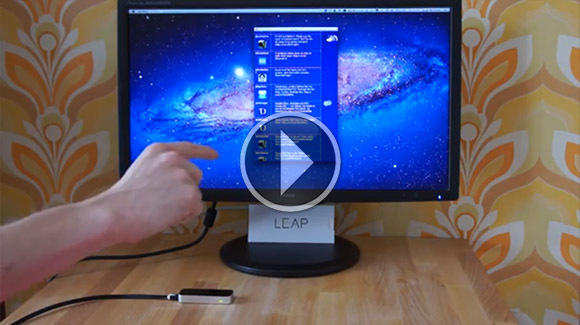 One of the Leap Motion Controller’s strong suits is making everyday interactions faster and easier. AirTwist is a Twitter client for Mac that makes it easy to scroll, favorite, and retweet with gestures alone. Best of all, creator JorgeDeCorte has posted the beta version for the community to review.